The ‘Quiet’ room presents a number of quieter play options. A reading spot and dress ups. 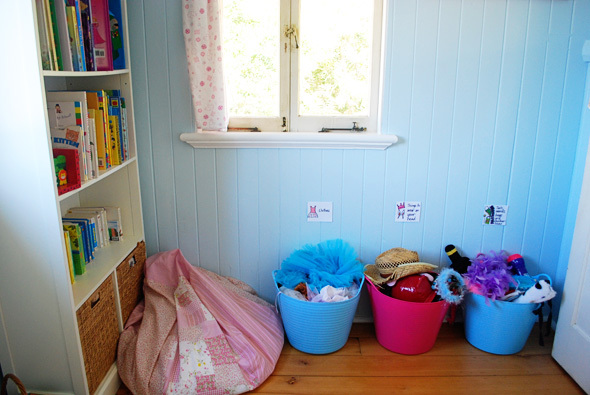 I think in fact that this lucky family have playful spaces scattered throughout their home that are always evolving to suit the families needs, much like Tricia shared in her popular post, Creating Children’s Spaces in Every Corner of your Home. Thank you again for sharing, Amanda. 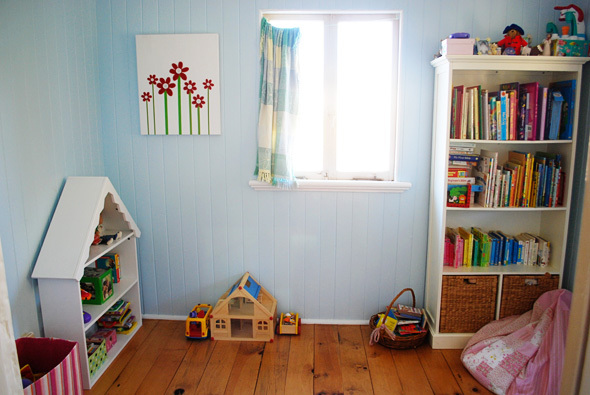 Do you have a family or kids play space in your home that you love (indoors or outdoors)? Submit your play space here and you too could be featured on Childhood 101. Be sure to visit the previous Our Play Space posts for more inspiration! Thanks Christie. I have to say that I stole that beautiful colour co-ordination in the bookshelf idea from you. so inspiring I have been thinking about the pictures on the toy boxes for my family day care kids, I think I will give it a go now. Thanks for sharing. Such a calming place for quiet play. Lovely.